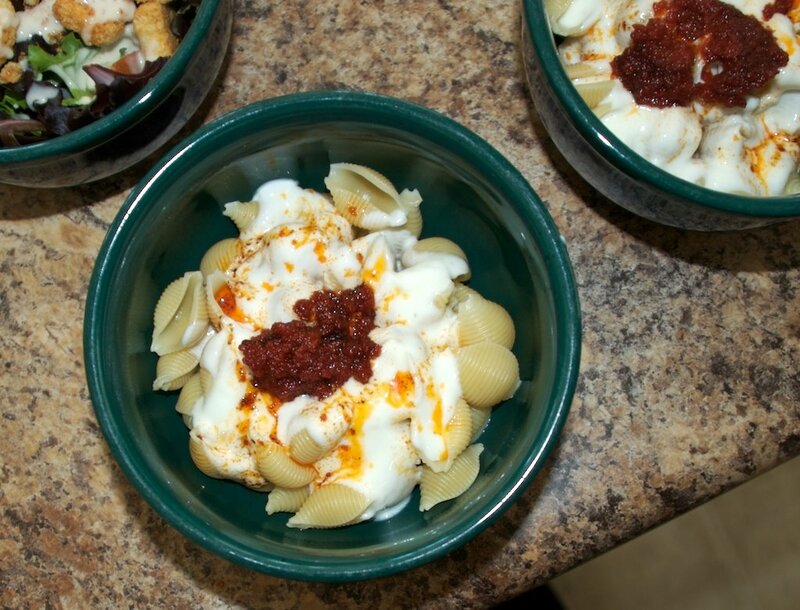 This is another recipe I learned from my local Turkish community. It is very easy and quite tasty. I once served it at a multi-ethnic potluck. I walked away from the table only to return when I noticed a group of Turkish friends hovering around the dish. Apparently, sautéing of the tomato paste is an important aspect of this dish, and I had executed it perfectly. Here I will confess that my sisters are much more talented in the kitchen than I am. My older sister instructed me in the making of this dish when I first learned it. I attribute my success to her patient demonstrations and this dish’s similarity to a Lebanese dish I make called Macaronis bil Laban. What I love about this dish is the sweet intensity the tomato adds to the creamy yogurt. Texturally, this dish is also very satisfying. I hope you try and enjoy it. Cook shells according to package instructions. Mix the garlic into the yogurt and refrigerate. Melt butter with olive oil in a sautee pan. Add tomato paste and red pepper. Sautee until tomato paste is fragrant and begins to look like little dots. The butter and paste should separate. Put shells in a bowl. Top with a bit of yogurt sauce and sprinkle with a pinch of mint, if desired. Add a dollop of tomato paste and a couple spoonfuls of the butter. Serve warm or at room temperature with a salad on the side. Confused about adding dollup of paste and spooning some butter at end. Do you mix the paste with the butter and olive oil? The paste and butter are cooked together, but the paste should separate back out of the butter as it cooks, so you spoon on a bit of the paste and then some butter from the paste pan.